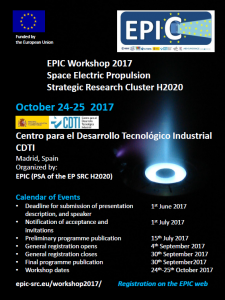 EPIC Workshop 2017 presentations available! The main objective of the EPIC Workshops is to present the Horizon 2020 Electric Propulsion SRC activities to the electric propulsion community and stakeholders and to collect and assess the latest electric propulsion technology developments in Europe. 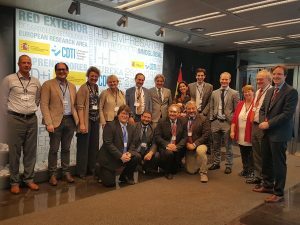 The EPIC Workshop 2017 was organized by the EPIC PSA and held on 24-25 October 2017 in Madrid, at: CDTI (Madrid), Spain; with the active involvement of all its partners (ASI, BELSPO, CDTI, CNES, DLR, ESA, UKSA, EUROSPACE, SME4SPACE). The EPIC Workshop 2017 was performed in two full days of intensive work and interactions, with 45 presentations and 47 speakers. 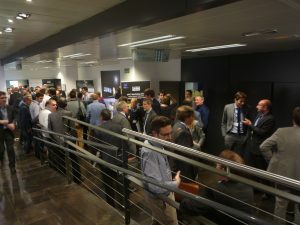 The Workshop had 123 participants, all from the European electric propulsion community, including the main space stakeholders in Europe. European participants came from: EC, REA, ESA, Space National Agencies, main Satellite Large System Integrators, main Satellite Operators, main Propulsion Subsystem Integrators, equipment industry, research institutions, universities, and industry associations. It was a great success! 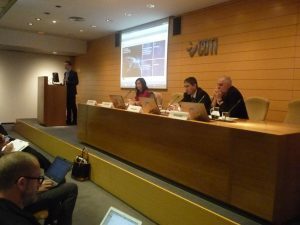 EPIC Workshops are the fundamental element of the SRC dissemination of SRC activities, and the collection of information for the EPIC SRC Roadmap. They have two objectives: an extensive exposure of the EPIC team ideas to the external world (commercial, scientific, programmatic, etc. ), and gathering of inputs, and to expand to the maximum the outputs produced during the EPIC project. The first objective was achieved mainly during the two first EPIC Workshops (Brussels in 2014 and Stockholm in 2015). 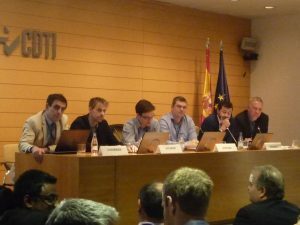 The second objective (also accomplished during the two first EPIC Workshops), is going to be achieved during next three EPIC Workshops (Madrid in 2017, London in 2018, The Netherlands (ESTEC) in 2019); where dissemination will be organized to communicate on the roadmap implementation and give a periodic status of the situation to all stakeholders interested. EPIC team will ensure the participation and presentation of all Operational Grants funded at the time, to show a coordinated approach and maximise the dissemination of the SRC progress and achievements.